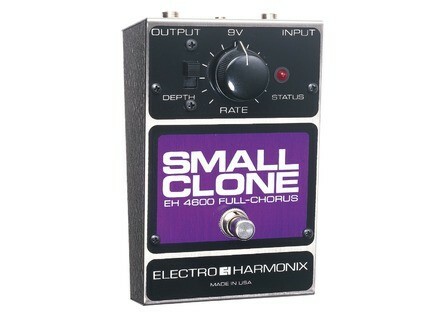 Small Clone Mk2, Chorus for Guitar from Electro-Harmonix in the Clone series. 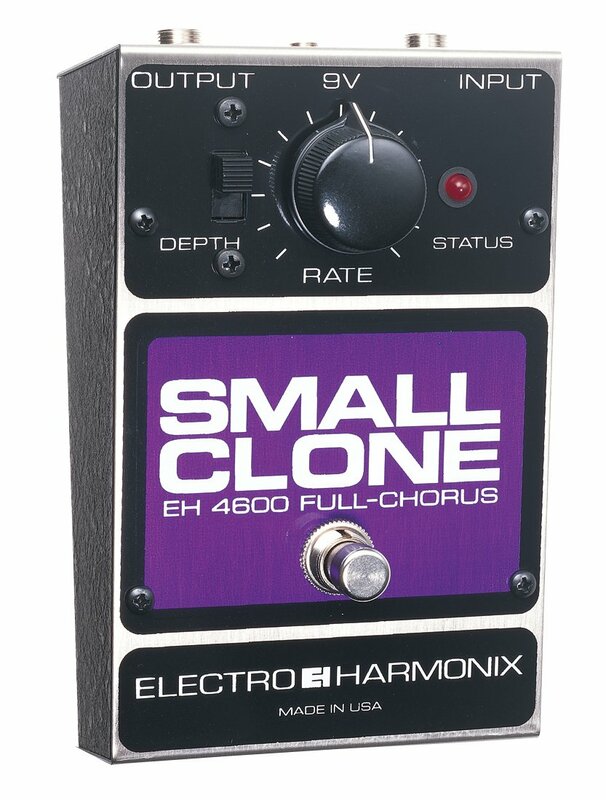 The Electro-Harmonix Small Clone (EH 4600 Full-Chorus) is a chorus pedal that can be used with any electronic instrument, but that I’ve only used with electronic guitar.<span> </span>This review will be focused on use of this pedal with electric guitar because of this, and is what most users will be using this pedal for. <span> </span>The pedal has standard ¼ inch connections and is powered by the nine volt power supply that comes with it. 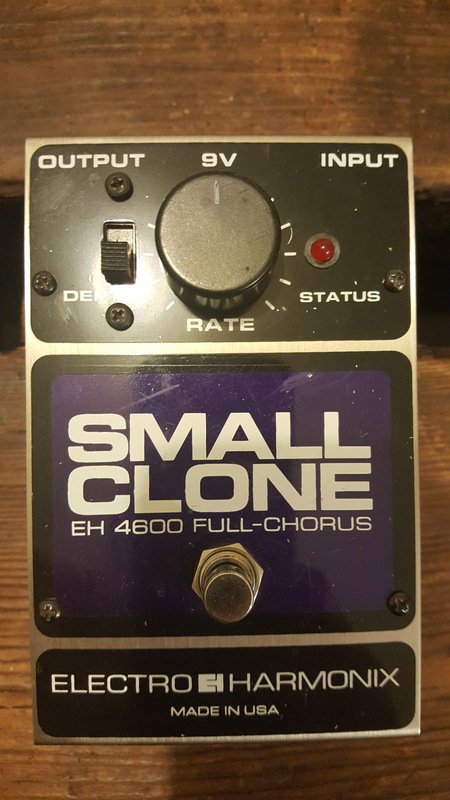 <p class="MsoNormal">The make up of the Electro-Harmonix Small Clone is about as simple as it gets for a chorus pedal, as it only has a small number of parameters to work with.<span> </span>All you’ve got is a large knob to set the rate, and a switch to choose the level of depth.<span> </span>While this isn’t all that much control, controlling the rate will give you a good variety of different types of tones, and the depth switch adds a lot as well.<span> </span>The up side is that anyone can use it without the help of a manual for sure. 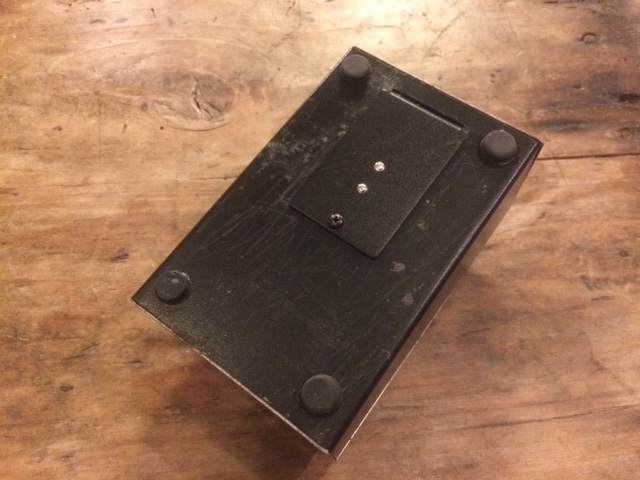 <p class="MsoNormal">There are very few pedals made by Electro-Harmonix that don’t bring something to the table in my opinion, and the Small Clone is definitely no exception.<span> </span>While I do wish there was a bit more versatility, for such a small pedal I really can’t complain as it packs a lot of power.<span> </span>The chorus tone can be described as extremely thick and regardless of where you set the depth, you’re going to get a wide sound, which is definitely something that I welcome.<span> </span>I’ve used the pedal in the recording studio with a Fender Stratocaster and a ’65 Fender Deluxe Reverb, so I’m definitely getting a clear enough signal to hear what this pedal truly sounds like. 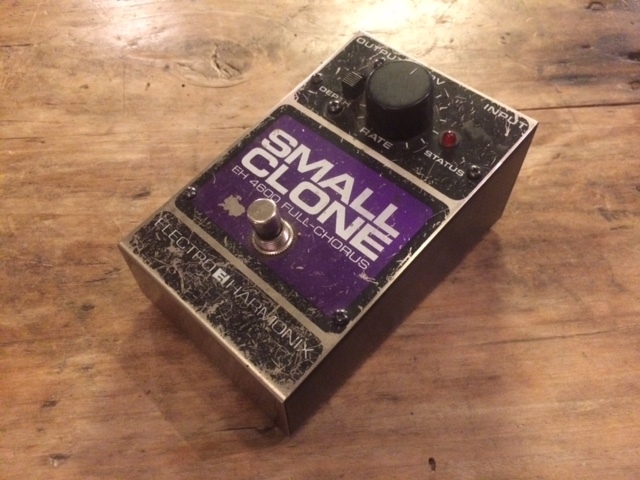 The Small Clone is a monaural analog chorus pedal with only one knob and one (two-position) switch. Seems rather sturdy, although the (non-true bypass) switch on mine is kind of messed up (it is almost detached from the metal case, still works though). Uses 9V battery or can be plugged using an adequate 3.5 jack AC adapter. I bought it used so there was no manual provided with it. The pdf available on Electro-Harmonix's website seems pretty useless though, unless you've never seen a stompbox in your whole life and/or don't trust your ears to set up that kind of basic pedals. Used with a Fender Fat Strat through a SansAmp GT-2 with the Small Clone in between (although most people use it in their amp's effect loop that is after the preamp). In both clean and distorted sounds, this pedal brings both warmth (a REAL LOT of) and clarity to any clean sound, while it will smoothen the harshest distortion. I love the way it sounds, very reminiscent of Nirvana's Nevermind (remember the vintage Small Clone was one of Cobain's favorites before he turned to the Polychorus). With the depth switch drawn in the upper position, the chorus sound is noticeably detuned, which may remind of some 80s-90s experimental rock bands such as Sonic Youth -- thus not very easy to use in most context... With extreme settings of the &quot;rate&quot; knob the effect is a little more on the Leslie side. Contrarily to what I've read here and there I haven't noticed a drop in volume when this pedal is active -- maybe it's different in an effect loop? I've used this pedal for approximately 6 months. I love the organic warmth that it brings, although it limits the range of sounds that it can produce. The settings can change the sound rather radically so it is definitely not as much a one-trick-pony as many people say, but you'll definitely need to try it to know if it suits your style (which is rather unlikely if you're looking for a cold, edge-cutting thrash metal sound). 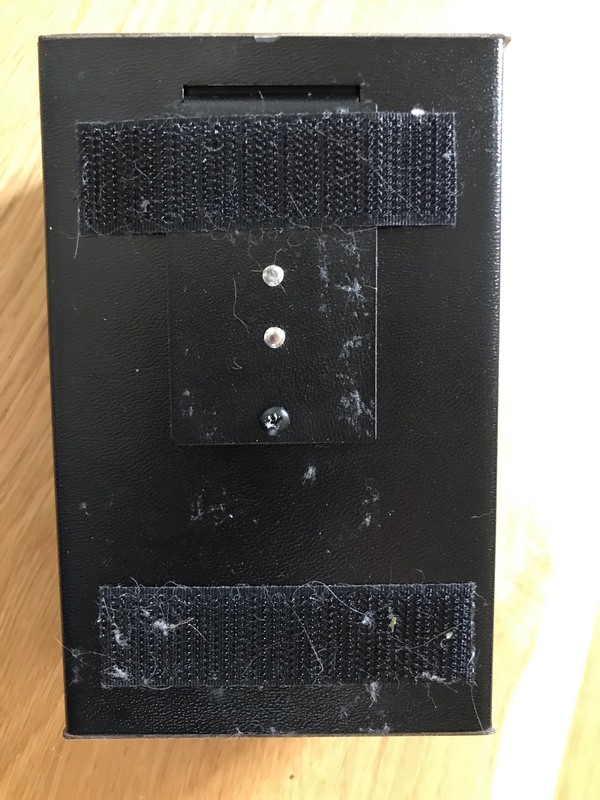 Anonymous 's review (This content has been automatically translated from French)" Liquid :)"
An input, an output, the power supply jack size (which tends to disappear at EHX), a knob and a switch. Analog Chorus. Given the array of fighter 1914 board, it is very manageable! This is not the perfect chorus, I even found my old (dod FX68 super stereo chorus) was best. But the sound of the small clone is just inimitable, and ultimately irreplaceable. The effect is not discrete, but sounds so good, clear as saturated (I put it in the effects loop) that I put everywhere! It's hot, it's music ... it's beautiful. Thierry255's review (This content has been automatically translated from French)" Heat happiness!" Pedal analog "legend", a switch for effect + or less pronounced and a knob to increase or decrease the speed of the effect. Mini jack adapter to provide, as on all former or the EHX Proco. Configuration simplissime! Or C you do not have arms to adjust and in this case you do not need this pedal! The patits faults I can find are: once the pedal engaged it is not easy to get a ultra discreet chorus, as if the couple with a distortion, when you do not play, you means an oscillation species (very light but C is heard; aillerus I wonder if it is not rather due to my One Spot power supply). Finally, there is an internal knob to adjust the rate of the chorus in wants to apply. Without touching CT perfect: I touched it and now cover I can not find the level on which it was calibrated before! (I did not look before turning, which nozzle I am) But gradually I close (I'm pretty psychopath at the sound reproduction), then I'm not very far from perfect and what happiness! Perhaps a knob instead of a switch would have been better to adjust the settings but still C to quibble! I use it on U.S. 74 Tele Deluxe and Rivera Chubster C bliss. This pedal warms me its a very nice way! I tested other chorus pedals with sounds more "standard" discrete, I did not like it at all! So in fact, it is hard to use this effect in a very discreet, but it's really endearing! Used for about a year. I tried MXR models (I found it cold) Malekko (hot and left me a good impression, at least 2nd test) Boss (moyennasse) and others. For now I have not found better. I still tate to move to a model more "upscale" but I find it hard to be satisfied with what I assaie! Would not that this pedal is so captivating that it makes other palichonnes? The further I go the more I say it is! Considering the price I will ever be the choice again! It has tiny flaws but what sound!